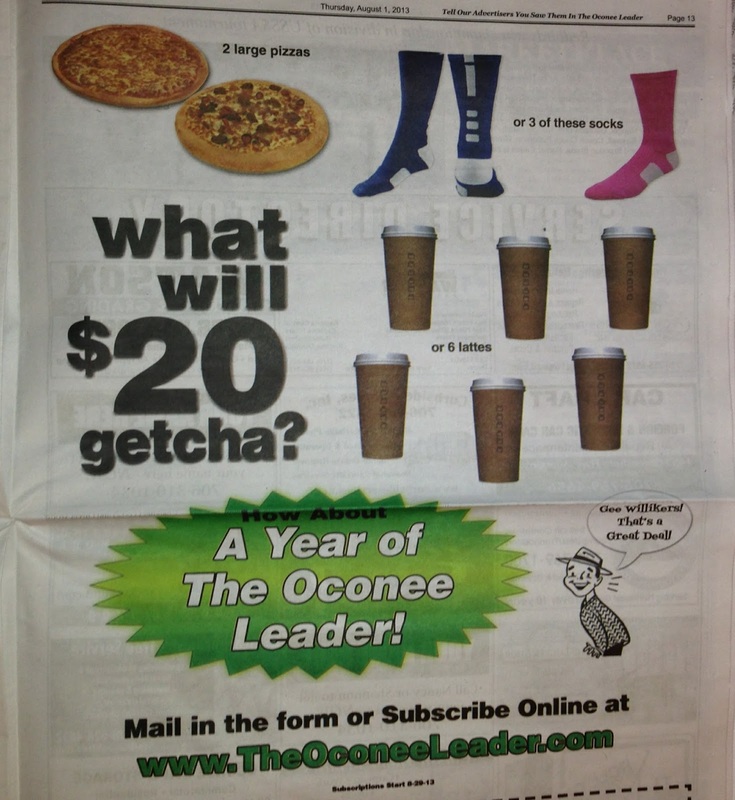 Somewhat less dramatic is the change taking place at The Oconee Leader, which has been selling subscriptions since April. Subscription delivery is scheduled to start Aug. 29. The paper has been delivered free to mailing addresses in the county since it was started in 2006. The paper claims to reach 92 percent of the mailing addresses in the county and to have a press run of 12,500 copies. The rival paid weekly, The Oconee Enterprise, lists its circulation as 4,300. AOL and Patch have been the topic of a whole host of stories in the business media, and particularly in the media sector, since last Wednesday. 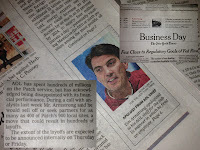 According to the Wall Street Journal story on Friday, news of the cutback were first announced in an earnings conference call on Wednesday when AOL Chief Executive Tim Armstrong warned such cuts were possible. On Friday, according to the story in the Journal, the company told Patch executives Friday that it is closing or finding partners for the 400 sites, replacing the unit's top executive, Steven Kalin, and laying off hundreds of employees. Stephanie Gross, editor of Oconee Patch, referred me to corporate public relations when I asked her in an email message yesterday for information on the local situation. I sent an message last night to the email address she gave me, but I have not gotten an answer. Oconee Patch went live in December of 2010. The site includes a mixture of short news stories, many focusing on schools and on crime, and contributions from community members. A summary of this blog regularly appears on the site. Traffic on the site has grown dramatically since launch, according to data given me when I placed advertisements with Oconee Patch for the Oconee Farmers Market. I am on the Board of Directors of the Market. Melissa Collins, the associate advertising manager, told me on April 11 that Oconee Patch had 26,449 “30-day uniques” in late February of this year. This is a measure of daily unique visitors to a site over the period. According to a story on Mediapost.com on Friday, Armstrong said during the earnings call that Patch sites were being clustered into three categories: those that are successes in terms of traffic and revenue generation; those shown to have the potential to be successful, and those that lack traffic or revenue potential. A given site, such as Oconee Patch, could be successful, however, but be surrounded by others that are not or be in an area that AOL does not see as having revenue potential. According to the Patch web site, Patch is now operating in 22 states plus the District of Columbia. Georgia has 46 Patch locations, according to the site, including those in Athens, Barrow County, Snellville and Lawrenceville. A half-page, black and white ad on an inside page of the April 11 edition of the paper had six lattes beneath that same question. The April 18 edition of the paper had a two-column by 10-inch color ad with three socks beneath the “what will $20 getcha” question. It also contained a full-page, black and white version of the pizza advertisement. In the April 25 edition, the Leader answered the question. 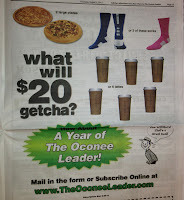 In a two-page advertisement in the center of the paper, it again ran the question, “what will $20 getcha?” This was followed by 51 images of the Leader. “A year’s subscription will be $20–the price of 2 large pizzas, 3 fancy sports socks, or 6 cups of coffee,” the ad copy said. The paper has been running a version of the ad regularly since, sometimes offering a $5 discount for subscriptions. The Aug. 1 edition has two full-page ads and a half-page ad touting subscriptions, and the Aug. 8 edition had two full-page ads soliciting subscriptions. Peecher said there were never a lot of out-of-county subscriptions and today that number is between 150 and 200. “Those are not included in the 12,500 circulation we have inside Oconee County,” he said. Peecher said the current shift to paid circulation is the first time the paper has asked Oconee County residents to pay for the paper. The shift from free to paid circulation will have two advantages for the Leader. First, it will provide revenue the paper is not now getting. Second, it will greatly reduce the print costs and mailing costs of the paper. The Leader is printed at Walton Press in Monroe, often with extensive and expensive color pages. Circulation is through the U.S. Postal Service. Display ad rates for the Leader and the Enterprise are nearly identical, I found in placing relatively small ads for the Farmers Market. The Enterprise has much lower print runs and much lower mailing costs by virtue of its lower circulation, and it has revenue from its $19 per year subscription fee. The Enterprise also is the designated legal organ for the county, meaning that it is the place where the county places its required legal advertising. To be selected as the legal organ, a newspaper must have at least 75 percent of its circulation paid for at least two years. AOL ownership doomed a third moderate-sized media-only outlet. Although striking a pretty good balance between the clear left/right slants of the other online services, it just wasn't reaching fair audience size. It is about time The Leader went pro. It is a fact of life advertising wags any outlet's dog, but 100% interest is detrimental to good reportage. Rob Peecher can write. It will be fascinating to observe how Libertarian he can be for subscriptions.